The computer was important to shipping container design even in the 1950s at the beginning of the containerization revolution. In 1956 Matson Navigation Company, a shipper who dominated traffic between the west coast of the U.S. and Hawaii, used computers to analyze thousands of shipments. Matson concluded that the 20-25 foot container was optimal. Another important feature of cargo container design were the heavy steel corner posts developed specifically to support stacking. Matson’s freighters were specifically designed to handle six high stacks of shipping containers. Matson turned computer power to analyzing the design of its cranes at Alameda and other ports and as a consequence improved load times to 400 tons per hour, which was 40 times the average manual load time from longshoremen. Cranes were specifically designed to meet the task of unloading standardized size containers loaded both in the holds and on the decks of Matson freighters. The newly invented electric cranes traveled on rails placed on both sides of the ship so containers could be unloaded efficiently row by row. After the first row was removed, the practice of roll-on, roll-off occurred, with loading and unloading taking place simultaneously. Approximately every 3 minutes a crane would complete a cycle of rolling on, and rolling off containers. Early shipping container design requirements dictated that freighters be outfitted with a structure of metal cells built to hold containers in place. They were 1 1/4 inches longer than the container, and ¾ inch wider and had cell guides that the crane operator had to ease the container in to. This was the design for the Ideal-X, the first container ship. The new design allowed for roll-on, roll-off loading and unloading, which is much more efficient than doing each in a separate process. An important aspect of shipping container design, the locking device, greatly impacted trucks as well. The locking mechanism on the trucks used to haul containers from the Ideal-X and other container ships saved time because it meant that the truck could be loaded and leave immediately rather than taking up time and space at the port having the cargo chained down. Ships also had to be redesigned to handle increasingly large loads of cargo. By 1969 ships specifically designed for the roll-on/roll-off cargo containers were carrying 1000 to 1200 20-foot (TEU) equivalents of containers on the North Atlantic routes and 1300 to 1600 TEU on the Asian routes. These new container ships were designed to go 50% or more faster than conventional freighters. 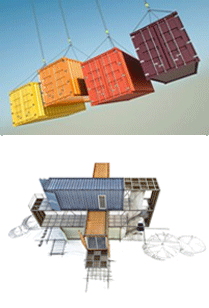 Shipping container design, and its impact on crane and freighter design, had come a long way by 1969 from its beginning in the mid-1950s.